Your Galaxy Tab is the ideal datebook and appointment calendar. Thanks to the Calendar app and the Google Calendar feature on the Internet, you can manage all your scheduling right on your Galaxy Tab. 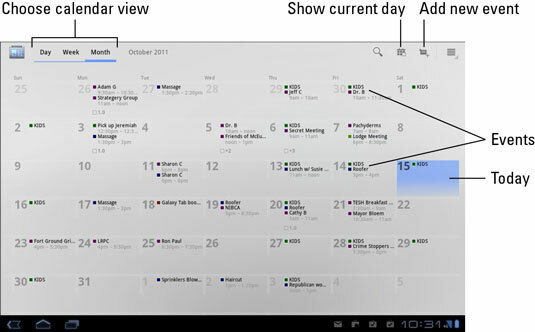 Use the Calendar app on your Galaxy Tab to access Google Calendar. It’s a better way to access your schedule than using the Browser app to reach Google Calendar on the web. You can summon the Calendar app from the Apps Menu. To view your appointments by week, touch the Week button. Or, you can touch the Day button to see your daily schedule. Use Month view to see an overview of what’s going on, and use Week or Day view to see your appointments. Use your finger to flick the calendar displays left or right to see the next or previous day, week, or month. To see more detail about an event, touch it. When you’re using Month view, touch the date with the event on it to see the Week view. Then choose the event again to see its details. Select the day for the event. Or you can switch to Day view, where you can touch the starting time for the new event. Touch the Add New Event button. The New Event screen appears. Choose a calendar category for the event. Set the meeting duration using the From and To buttons. Because you followed Step 1, you don’t have to set the date (unless the event is longer than a day). Touch the time buttons, if necessary, to adjust when the event starts and stops. If the event lasts all day, touch the All Day check mark. (Optional) Type a location for the event in the Where field. Specify whether the event repeats. Touch the Repeat button to set up a recurring schedule. Set whether the event has a Reminder. The Calendar app is configured to automatically set a reminder 10 minutes before an event begins. Touch the Done button to create the new event. The Done button has a check mark by it, and it’s located in the upper-right corner of the screen. You can change an event at any time: Simply touch the event to bring up more information and then touch the Details button. Choose Edit from the top of the screen to modify the event. To remove an event, touch the event to bring up more information and touch the Delete button at the top right of the screen. Touch the OK button to confirm. Adding an event location not only tells you where the event will be located, but also hooks that information into the Maps app. Type information into the event’s Where field just as though you’re typing information to search for in the Maps app. When the event is displayed, the location is a clickable link; touch the link to see where it is on a map. Use the Repetition item to create repeating events. Reminders can be set so that the Tab alerts you before an event takes place. The alert can show up as a notification icon, or it can be an audio alert or a vibrating alert. Pull down the notifications and choose the calendar alert. You can then peruse pending events. If you create events using the Google Calendar on the Internet, those events are instantly synced with the calendar on your Galaxy Tab.